On the last day of December’s legislative session, Michigan’s Republican-dominated Legislature approved a $10 million grant to bring water and sewer lines to land owned by a company led by the former chairman of the Michigan Republican Party. The grant will help add utilities to 1,400 acres near M-14 and Gotfredson Road in Salem Township in eastern Washtenaw County. 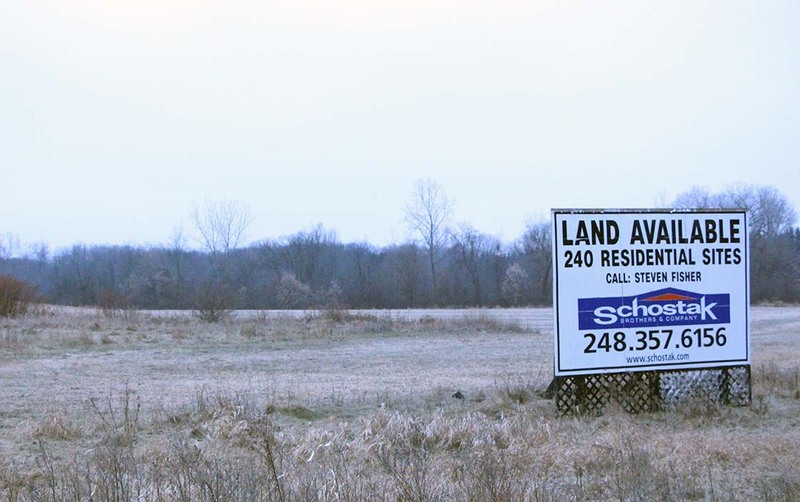 Property records show 560 acres of that land are owned and slated for development by Schostak Brothers & Co. of Livonia. The company’s chairman, Bobby Schostak, served as chair of the state GOP from 2011 to 2015. But the township of 6,100 residents has long maintained that private developers – not taxpayers – should fund infrastructure on the land, said Salem Township Supervisor Gary Whittaker. He said the township has other needs and expressed displeasure at how the request was made using state tax dollars. “I’m a conservative Republican. But this kind of stuff makes me sick,” Whittaker said. Schostak, whose family has donated hundreds of thousands of dollars to mostly GOP candidates, told Bridge Magazine the grant will help the region and Salem Township, which he said asked developers for help in bringing utility lines to the area. “We raised (the grant) as an option with state policy makers and appreciate their support for this kind of infrastructure and economic development project that can help strengthen the community and support families and schools,” he wrote Bridge. Property records show Schostak Brothers has spent more than $28 million since 2001 on parcels north and south of M-14 between Gotfredson and Napier roads for a planned subdivision and commercial development. Located between I-275 and U.S. 23, the area is by far the least developed in a corridor that has seen tremendous growth in the past 30 years. But large-scale projects can’t be developed without water or sewer lines. Neither Schostak nor several lawmakers who spoke about the spending to Bridge Magazine said they could identify who in the Legislature championed the project. The $10 million grant was equal to the largest of the $113 million in “enhancement grants” that lawmakers approved on the last day of their lame duck session, Dec. 21. The spending was included in a larger, $1.3 billion appropriations plan that was key to a compromise between Republicans and outgoing Gov. Rick Snyder to fund his priority projects such as toxic waste cleanup efforts. The latest grant follows one in 2017 that directed an initial $10 million to Salem Township to also help with infrastructure work near Gotfredson Road and M-14 including land owned by the Schostak company. The spending was included in an appropriations bill that also awarded money to other communities. Bridge Magazine has reported that most of the grants approved in the final hours of the Legislature’s lame duck session were advocated by lawmakers to fund projects in their districts. But State Rep. Donna Lasinski, D-Ann Arbor, who represents Salem Township, said she couldn’t find out from lawmakers and legislative staffers who included the $10 million grant for water lines in the larger spending bill. “I had absolutely no knowledge (about the grant) until the wee hours of lame duck,” Lasinski said. She said the grant for Salem Township could have been better spent on communities such as Flint, Detroit and Grand Rapids suburbs that struggle to provide safe drinking water. “Yet we’re willing to put $20 million (total) for water development for a for-profit company,” she said. Now-former State Sen. Dave Hildenbrand, R-Lowell, who was chairman of Senate Appropriations Committee during lame duck, told Bridge he did not know who requested the money. His counterpart in the House Appropriations Committee at the time, now-former State Rep. Laura Cox, R-Livonia, told Bridge she didn't know who backed the grant and said negotiations among legislative leaders and Snyder administration officials were private. Cox was identified as the advocate of the first $10 million grant for the project in a 2017 story in the Plymouth Voice newspaper. The article quoted Kurt Heise, supervisor of neighboring Plymouth Township, as saying Cox helped Schostak Brothers get the grant. Cox told Bridge last week that she “neither denied nor confirmed” that account in the 2017 article. Any attempt to single her out is wrong, she said. “It would be preposterous to believe that one person such as myself, a state rep, would have the ability to put a $10 million grant in the budget,” she said. “It’s voted on by the entire leadership, both sides (House and Senate) and the governor signs it. That’s the story. Not me, Laura Cox,” said Cox, who is now seeking the chairmanship of the state Republican Party. The former governor could not be reached for comment. Bridge Magazine sent questions to Ari Adler, who served as his spokesman as governor. Adler said he is no longer handling Snyder’s communications but said he forwarded the questions. "If no one is responding to you, then the choice may have been made not to respond,” Adler wrote in an email to Bridge. In 2016, Snyder’s leadership political action committee got $10,000 from the Schostak Family Political Action Committee, which Schostak told Bridge is funded by his family’s donations. As a candidate and later as governor, Snyder repeatedly said the state shouldn’t use incentives to chose “winners and losers” when it comes to development. State records show the Schostak Family PAC has given $700,000 to political candidates since 2008, including $63,000 in 2018 to many members of Michigan's Republican leadership. Over the years, it has also given to some Democrats including Detroit Mayor Mike Duggan and U.S. Rep. Brenda Lawrence of Southfield. As finance chairman of the state party, Schostak helped raise $30 million in 2010 for the Republican Party. Schostak said his family’s political giving reflects shared values, including economic development. Schostak Brothers & Co. envisions two developments in the area: North of M-14, covering 200 acres, and south of M-14, covering nearly twice as much land where the company hopes to develop more than 500 homes and commercial development. All told, the cost of bringing water and sewer to the property totals over $30 million, said Whittaker, the Salem Township supervisor. Schostak said construction of the utility lines could take up to two years after design and engineering is complete. Whittaker said the Schostak company has previously asked the township to borrow the money through a bond which would be paid off by developer fees. Whittaker said the township declined. “The Schostak people have done a good job getting taxpayers to pay for their project,” said Heise, the supervisor of neighboring Plymouth Township and a former Republican state representative. Heise said Plymouth Township neighbors are worried the development could hurt their community. Salem Township has a part-time fire department and contracts with the Washtenaw County Sheriff’s Office for police services. Located just across Napier Road, Plymouth Township has both departments, and Heise said many fear those agencies will be burdened by the development. Schostak defended the use of tax dollars and said the state’s money will lead to an economic boon in the region. “A state grant like this helps cover necessary public infrastructure to inspire community economic development and manage growth, which stimulates jobs and tax revenues, and leverages private investment – again to help benefit Michiganders, communities and state,” he wrote to Bridge in an email. "His counterpart in the House Appropriations Committee at the time, now-former State Rep. Laura Cox, R-Livonia, told Bridge she didn't know who backed the grant and said negotiations among legislative leaders and Snyder administration officials were private. " >>Hence the need for FOIA. With the public infrastructure issues impacting the health and safety of Michigan citizens - how can this be anything other than crony capitalism? A principled alternative to these Republican efforts needs to exist. I have been wondering what the $10 Million 'Lame Duck' grant for Salem Township was going to be used for. Goodbye open fields, hello to 500 more houses and commercial business. Gee, can I get a state grant to put in the power, dig my well, and put in the sewer on my new property? I never knew this was an option. Where do beggars like me go to apply? I'm a hard-working tax payer and my taxes in this undeveloped area will benefit the community. Step 1: Buy your way into an elected position. Step 2: Promise other politicians mega-donations or new business in their district (with substantial tax breaks, of course). Step 3: Sneak the grant into a whirlwind lame duck session so it wont be noticed for a month. Step 4: Privately, kick your feet up and enjoy the new lax regulations and free money on your business/property. Publicly, feign ignorance on the whole process. I'm so tired of the terrible campaign finance laws, lack of transparency, and revolving-door politics in both State and Federal govt. So will we also be paying for the sound barriers that will be requested in a lawsuit over noise. These homes should not be allowed near any major roadway, unless the developers put up their own sound barrier park near roadway and NOT homes. Highest form of criminals. In Brighton Township they just raised sewer taxes to about 900 homeowners to subsidize the massive sewer construction that is sitting idle. Pay to play just reached a new level of corruption. Nobody knows who backed the grant: if you believe that I'll sell you the Mackinac Bridge. This is why MI ranks 50th in transparency. This is another reason to get rid of lame duck. End the legislative year a month before the election. Very well stated, Mary! The 2018 Lame Duck session was an epic disgrace, on many levels. Today it is hard to know the truth about articles involving tax payer money. Cities, towns and township do need to give tax breaks to further the development of our states living in the future. Sadly I have kind of given up on honesty in our state and federal governments. Let God be the Judge. This is WRONG, WRONG, WRONG. The only way any economic grant should be issued is to have the grant refunded once the receiver is in operation and making a profit, or in other words, a no / low interest government loan to the person receiving the grant. Sure, there will be times the grant receiver will go under before repayment of the loan, but that is like any other transaction where some percentage defaults. Where specifically is this funding coming from? I believe it comes from the state general fund. All the more reason to abolish Lame Duck. We need a citizen-initiated constitutional amendment to end the legislative session before the biennial election. The only exception should be an emergency session called by the governor with no actions beyond those required by the emergency and the right of any legislator (or citizen) to sue before the MI supreme court to nullify any bills that do not directly address the emergency. In the meantime, Governor Whitmer should sequester this money and urge the legislature to repeal the appropriation. Except the Republicans also passed a bill in lame duck to make it much more difficult to do a citizen led initiative. They saw the success of the recent proposals that were grassroots efforts by MI citizens and have decided they will not let the will of the people infringe on their power and greed. All Republicans must be removed from positions of power in MI. Can we get this repealed? Is there a legislative way to put holds on grants like these until they are fully investigated? End Lame Duck to help stop corruption in Michigan government. Nothing to see here... just good ol' 'Crony Capitalism' as practiced by MEDC, SPARK, etc. You know the right people and where to send the 'campaign contribution' and presto you're awarded money to 'create jobs'. Almost no strings attached and you can walk away with the money and no monitored / policed 'job creation' numbers required. The Legislature should not be subsidizing suburban sprawl in southeast Michigan. The lack of transparency just makes a bad problem worse. Especially when we in Salem don’t want them here! When they run for office, nearly all Republicans say they want to eliminate "waste, fraud and abuse in government." Now we know the best way to achieve that goal is to keep Republicans out of office. Back in 2012, the Michigan legislature passed legislation, Nonrecourse Mortgage Loan Act (NMLA), which would bar lenders from obtaining relief against some guarantors who signed mortgage guarantees on commercial properties. Back then, the Traverse City Cherryland Mall was owned by a Schostak entity and its mortgage was guaranteed by the Schostaks personally. The mall mortgage was in default and the lender may have looked to enforce the guarantee. The legislation was passed to protect the Schostaks from liability the legislation was enacted to protect. I do not know the disposition of the default on the Cherryland Mall. Laura Cox probably doesn't know who suggested that one either. Gosh, these ideas just show up when you squeeze lemon onto blank paper. Funny how she didn't know how something benefitting her district just showed up in legislation. Why would anyone else put it in there without talking to her? It is things like this that make Michigan's legislature one of the most corrupt in the country--and thanks to our self-dealing legislature most of it is legal. Our Republican-dominated legislature is fundamentally corrupt. Once we have fair redistricting, we might have a legislature that is willing to drag these former legislators before committees that will put them under oath and make them either tell the truth or--thanks to a Democratic attorney general--go to jail. Can't we the people take them to COURT for this? Another one of many reasons to not vote Republican. Totally should not have happened! They should all (well the ones left in office) should be kicked out/brought up on some sort of charges - ethics, criminal, etc. Looks like our previous Governor just paid off a favor/debt! If this surprises you, you weren't paying attention from 2011-2014. Snyder showed us his hand with six of a kind, and we let him stay at the table anyway. He was the first head of an agency dedicated to looting the school aid fund and using the proceeds to build stuff that no private capital will fund. Expressions of shock now reek of naivete. The Republican legislature not only know how stupid the Michigan voter is, they bank on it. Just what we need, more sprawl and wasted tax dollars. Thanks GOP! So a $10,000 donation got them $10,000,000 . Meanwhile poor communities get $0. Free Market Capitalism is championed by the GOP; nothing about this deal is Free Market. A private company thrives or fails based on intelligence and hard work of its owners. The last minute, no transparency nature of this deal stinks of political corruption. Hopefully the new State Attorney General and Governor Whitmer take legal action against Schostack Brothers and Company. Maybe this won’t make him the kind of money he hopes it will! We can only pray. Isn't Salem Twp part of the greenbelt buffer area that Ann Arbor and several non profits have been trying to develop for a couple decades? This is just a developer money grab to sweeten their own pockets. Someone needs to file lawsuit to stop or investigate this.